Photo by chotdaNow…I am English, so this may be a little biased. Let’s face it though, it doesn’t count as bias if I am right….which I am…so I won’t mention that further. What the hell am I talking about? Well, the constantly ongoing feud between the ‘mite fans..Vege (boo) and Mar (yey). On the surface, two very similar products…crack open that yellow top though and you will find things much different. 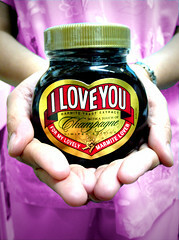 Marmite, is more of a gloopy consistency which makes it easier to spread. Whereas Vegemite is the same consistency of, say, earwax. Speaking of earwax, that quite accurately describes the “taste sensation” of Vegemite. Let’s put a myth to rest shall we, thanks to our wonderful Wikipedia friend. Marmite has been produced since 1902 and Vegemite since 1922…and even managed to withstand the amazing idea to remarket Vegemite as Parwill (as in Marmite like it, but Parwill)…genius or what? So Marmite is indeed the original AND the best. Vegemite has never managed to take off outside of Australia, whereas Marmite is popular in most places…including Australia. The Marmite slogan “Love it or Hate it” would never work with Vegemite…Be honest, “Hate it or Really Hate it” doesn’t offer much in the way of guaranteed sales. It’s my theory that Vegemite sells so well (albeit in Australia) due to the human fascination of sharing horrible experiences. You know what I mean…if you go to a restaurant and order something which ends up tasting disgusting…what’s the first thing you do?? You offer a mouthful to the person you are with and say.. “Here, taste this, it’s disgusting”, or something with a more colourful use of your chosen language. Same as road accidents, you don’t want to look…but you might see a lopped off limb. There you go, Vegemite is the roadkill of the foodstuff world. Whereas Marmite is a versatile product that has been turned into crisp flavours, added to sausages, flavoured Twiglets and released in various other guises. They even do a squeezy version…in direct comparison to the Vegemite marketing idea of making it look like one of those old tubs you find in a garage with some hideous substance inside, that noone knows what it is, but noone wants to throw away…just in case. In a nuclear holocaust…cockroaches won’t actually survive as is the popular belief..because Vegemite will be the only foodstuff left untouched. They will evolve into a lemming-like breed of weakling cockroaches, simply to avoid having to chow down on the stuff, they will throw themselves into the molten lava running through our cities. I am glad I could clear that up in an analytical and, above all else, impartial way. This entry was posted in Stuff by Dave. Bookmark the permalink.